(Clearwisdom.net) The Second International Chinese Vocal Competition, held in New York City's Town Hall, concluded on August 10, 2008. Hong Ming and Hong Yuqing won the Gold Award in the Bel Canto Men's and Women's Division. The Gold Awards in Folk Singing Men's and Women's Division were vacant. The competitors expressed the feeling that they have benefited a lot from this competition. Several Western vocalists who watched the competition said that the competition gave them a window into traditional Chinese culture. 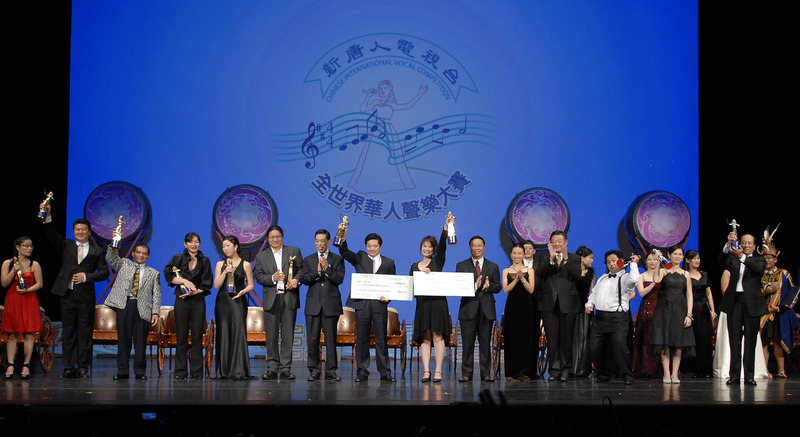 The Second International Chinese Vocal Competition, held in New York City's Town Hall, concluded on August 10, 2008. Hong Ming and Hong Yuqing won the Gold Award in the Bel Canto Men's and Women's Division. Mr. Lu Mingsen, the chair of the Taiwanese Chamber of Commerce in New York, came to the competition with his family. He said to a reporter, "I did not expect to see such a high level of competition. It was really hard for the judges. It is great that NTDTV held such an event which so profoundly demonstrates traditional Chinese culture." Karen Stanislaw, a poet and visual artist from New York, expressed that her favorite was Hong Ming's singing. Although she does not understand Chinese, she can sense the sincerity in his singing. "He is a talented singer," she said. Ms. Stanislaw commented that through the competition, she could see that Chinese culture is self-disciplined and conservative. Christine Walevska, a world-class cellist, attended the competition. Christine Walevska, a world-class cellist, attended the competition. She liked Hong Ming and Jason Fuh's singing the most. She said that Jason Fuh manifests the emotions of traditional folk people very well. Ms. Walevska said that the Chinese language lends itself well to singing. Bronze award: Contestant No. 60 Xu Fenglin from the U.S.A.
Silver award: Contestant No. 168 Ning Zheng from the U.S.A. Bronze award: Contestant No. 178 Liu Wei from the U.S.A. and No.71 Yiji Dadao from Taiwan. Honorable mention: Contestant No. 166 Gou Bei from the U.S.A. and No. 64 Hu Daiming from Taiwan. Honorable mention: Contestant No. 30 Wang Tingyi from Taiwan; No. 147 Chen Huiru from the U.S.A.; No. 70 Li Fangyu from the U.S.A.; No. 17 Chen Anne from Taiwan and No. 160 Chen Jingyi from the U.S.A.
Gold award: Contestant No. 177 Hong Ming from the U.S.A.
Silver award: Contestant No. 134 Qian Long from the U.S.A. Bronze awards: Contestant No. 156 Zhaixi Duoji from the U.K. Honorable mention: Contestant No. 135 Jason Fuh from the U.S.A. and No. 167 Kidd Wong from the U.S.A.